Posted Sept. 12, 2013, 12:51 p.m. I use Re-drum loads. 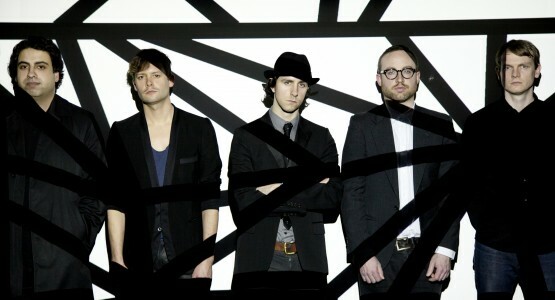 Most of the Maximo Park songs I write start with me programming a beat that goes with the tune I'm working on. That beat may then getting mirrored by live drums. I love using it as sample trigger through the tracks. What's the best music making tip you ever got? A tip from Neil Young - Always listen to your mixes next door if they sound good there, you're on the right track! Do you have any favorite sound or patch? The 'Disco Snare' is a great default snare for any style if you're working quickly. What do you do when writer's block strikes? I tend to have 3 or 4 songs on the go at once so if ones not happening I switch to another. Alternatively I do something different like work on an imaginary soundtrack or create hybrid noises by combining effects, songs often materialise from that. What has been the best moment in your music making career thus far? Our band has been very lucky in that we have been able to travel the world & play great places but despite that my best moments are simply having the freedom to write & do something I love everyday, I'll never take that for granted. Any Words of Wisdom for aspiring producers and musicians? I guess it sounds obvious but if you have the drive & can work hard you're giving yourself a head start. If you're writing or producing listen to lots of varied things & try music you wouldn't normally listen to, it'll keep your own ideas fresh.